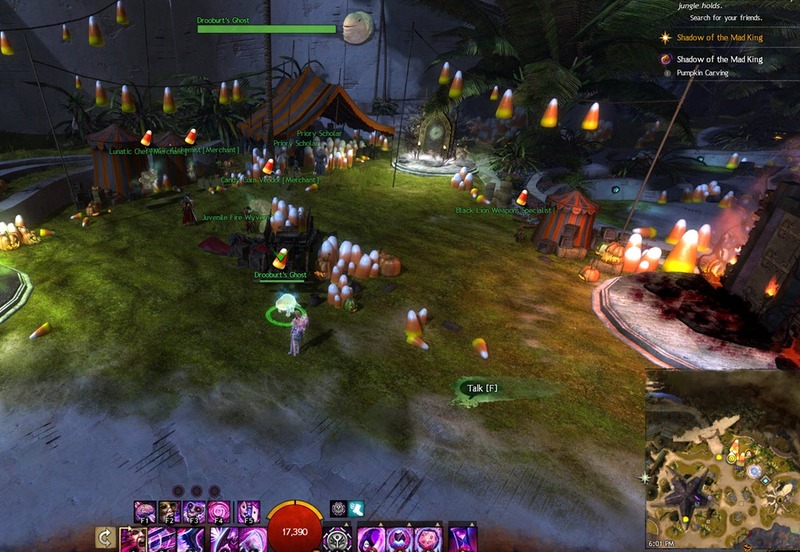 A guide to GW2 Halloween Festival 2015 that arrived with Heart of Thorns on October 23. Arenanet has said that Halloween will end in roughly 2 weeks but no specific date has been given. 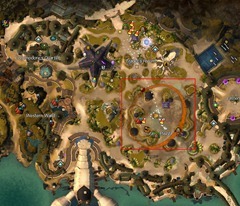 The entrance to these activities can all be found in Lion’s Arch. 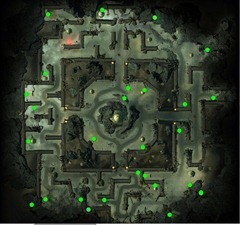 They are marked on the map as door. The exception is Mad King Says which occurs in Grand Piazza instead. Mad King’s Clocktower – Not much has changed but it give you an exotic chest on the first run and 5 trick or treat bags on subsequent runs. If you are really good at jumping puzzles this might be a good option to farm Trick or Treat bags. 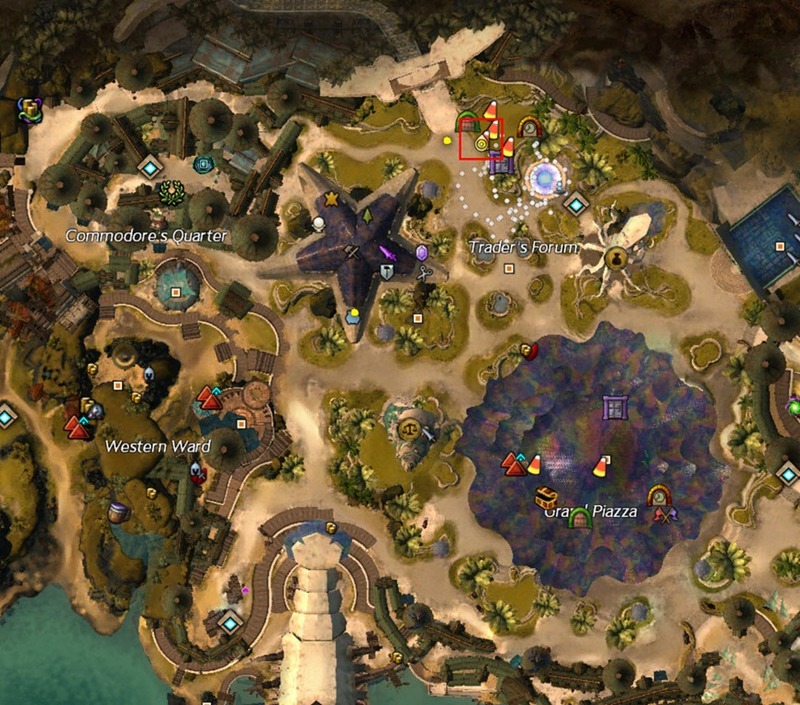 Mad King’s Labyrinth – Basically where people go to farm for Trick or Treat Bags. It is a farming map where you go and follow a commander to run around killing mobs, close doors and carve pumpkins. 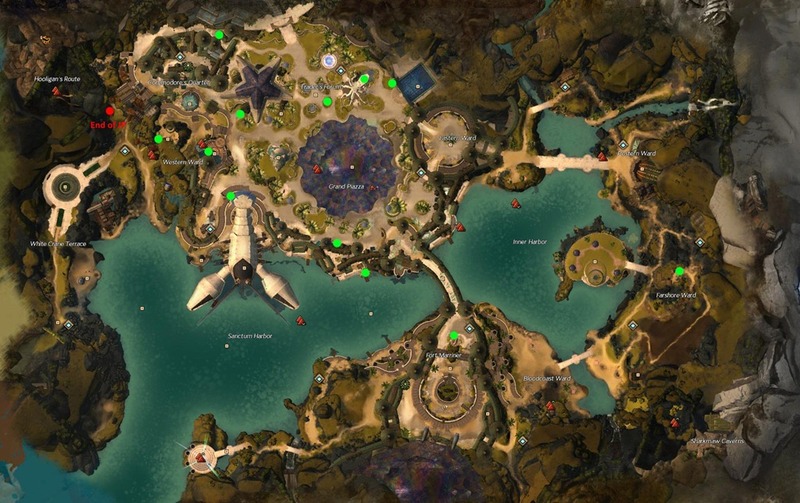 Use the LFG to find a farming instance. Ascent to Madness – This year this dungeon is being farmed constantly for the chance at a new drop Tattered Bat Wings which is used to make the new Nightfuy Ascended shoulders. It is a 5 man dungeon and the end chest have a chance to drop the Wings so you can run it as many time as you want for a chance. Use ingame LFG tool to find a group. Mad King Says – Occurs every 2 hrs on the hour at Grand Piazza. Basically you do the emote that Mad King tells you to but only emote if it is followed by Mad King says as he will try to trick you. On every successful emote (or inactivity if he tries to trick you) you will get a stacking buff. Every 4 stacks of this buff you are eligible for a Mad King Chest Key fragment. You can only get 3 key fragments a day and you need 3 fragments to combine together to make a key. 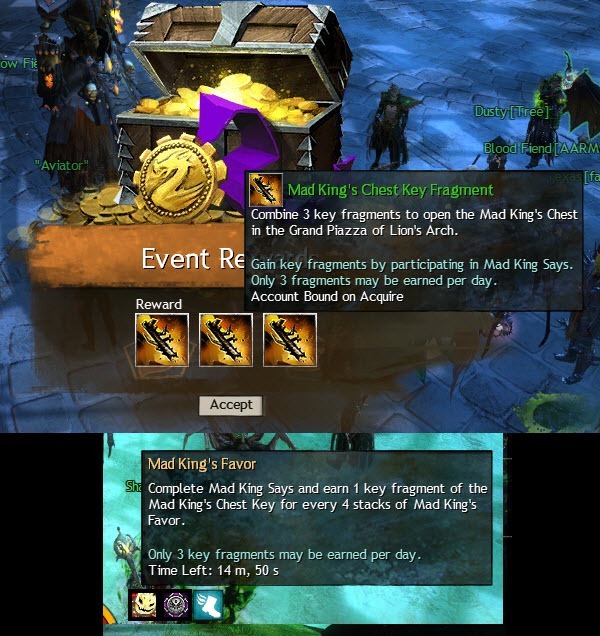 This means that you can only only open the chest at end of Mad King Says once a day and you must participate for a specific duration to get rewards. The chest also have a chance to drop Tattered Bat Wings and the new Mini Spooky Moa. Nightfury Shoulders – New ascended armor skin introduced this year. Very expensive to craft. Read the linked guide to see the process. 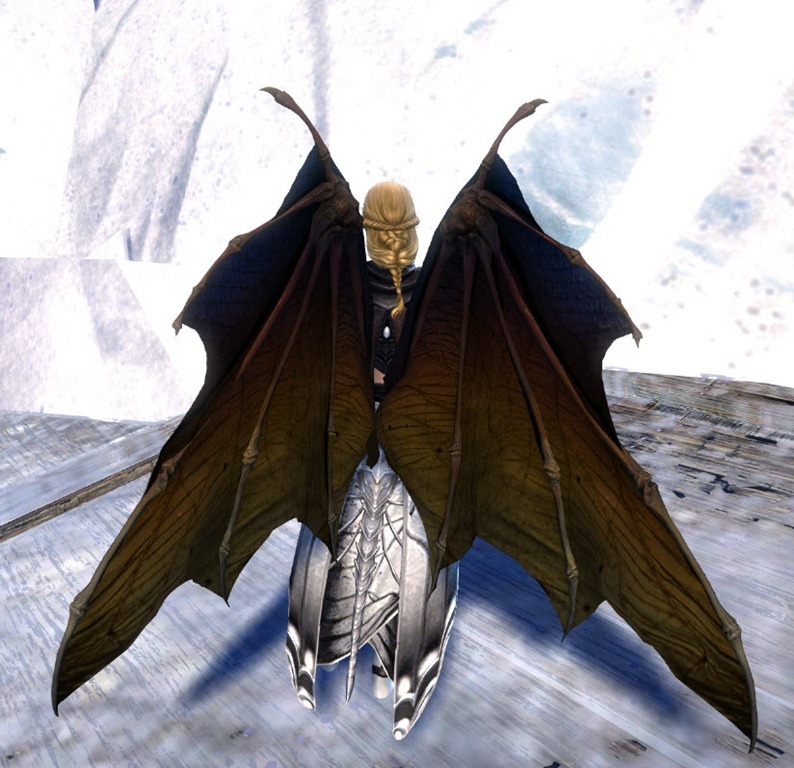 Bat Wings – 700 gems from Gemstore. New backpack for this year. Lunatic Guard Outfit – 700 gems from Gemstore. New outfit for this year. Ghoul Backpack – 600 gems from Gemstore. New for this year. Devil Horns – 200 gems – Old gemstore item. Phantom Hood – 200 gems – Old gemstore item. New Trick or Treat Bag weapon skins – these are all rare drops but can be brought on the TP as well. You can buy these old weapon skins from Halloween 2013 for 2 Black Lion Claim Tickets as well. Three new minis have being added. Open 50 Trick or Treat Bags, probably the easiest achievement to do. Complete a round of Mad King Says, pretty easy to do as well. 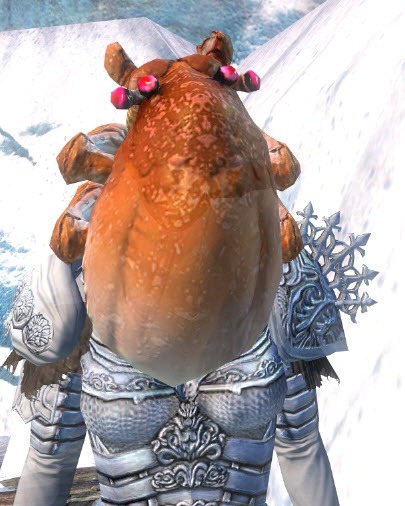 You need find Drooburt’s Ghost in Lion’s Arch. He is usually at Trader’s Forum but he can disappear sometimes. Just hand him 1000 Candy Corn for this achievement. 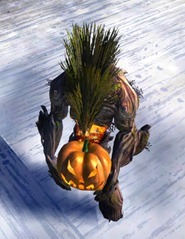 Find 150 Pumpkin all around Tyria and carve them. The pumpkins reset if you switch to a different map/characters and also reset daily so you can just do them in Lion’s Arch and Mad King’s Labyrinth. 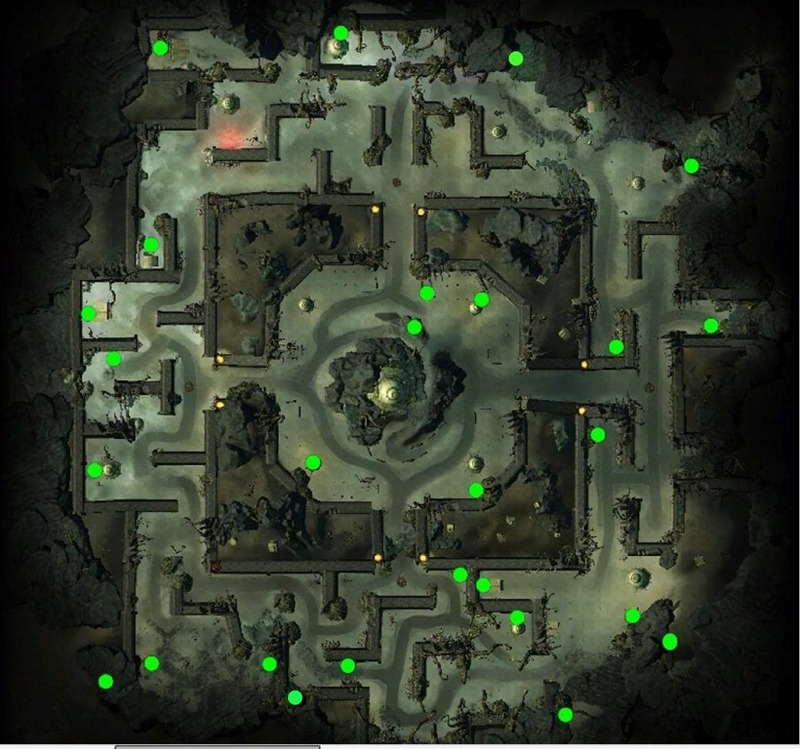 it is much better to do them in Mad King’s Labyrinth since it is faster and there are more of it in a smaller area. Mad King’s Labyrinth map taken from /u/Evio on reddit.. Lion’s Arch map from /u/Oonk_Golemancer on reddit. 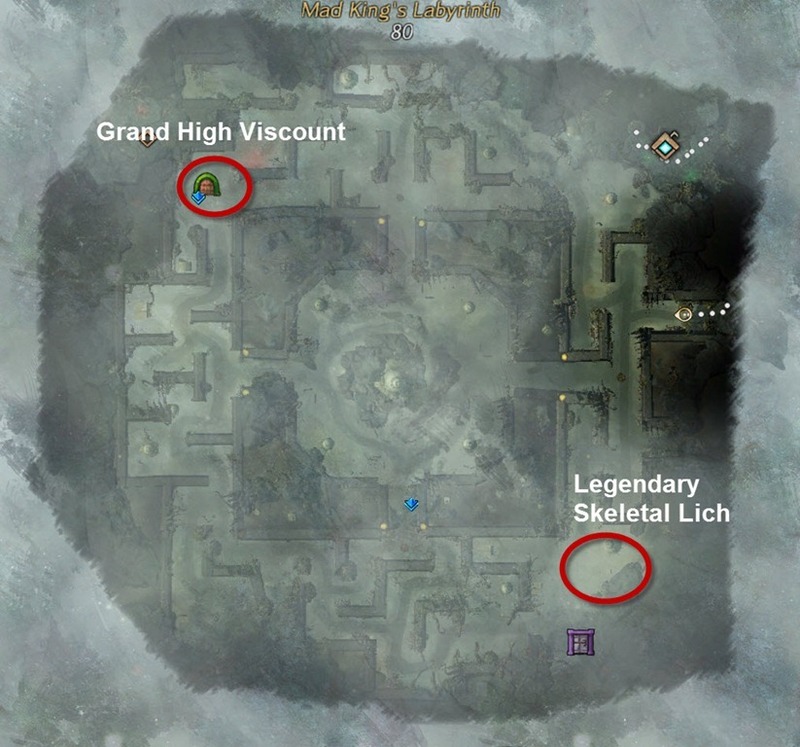 Complete 50 door events in Mad King’s Labyrinth. Pretty simple to do if you spend enough time there. Need to stomp 20 players with Scarecrow of Mad King finishers. 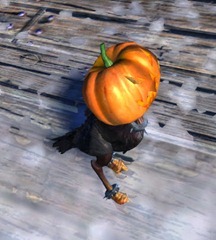 You can get temporary ones from the Trick or Treat bags or buy permanent ones from the gemstore. You will need to do sPvP or WvW for this achievement. 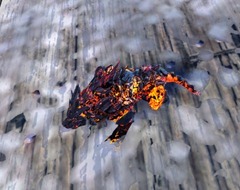 The following 3 achievements are all associated with Mad King’s Labyrinth bosses. To locate these guys, look for doors inside the Labyrinth, they seem to spawn at specific locations.. These bosses spawn from the doors but they are on a timer so not all doors at that location will spawn them. These bosses are all group bosses and are not soloable. They give 2 Aps and 5 Trick or Treat bags each. How is it bugged? Seems to add skin automaticly to wardrobe and give u a free skin like it should? 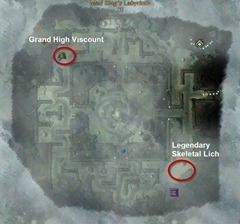 Some info on the mechanics of the two Labyrinth Bosses. Grand High Viscount of Candy Corn’s main mechanic is that he’ll periodically put puddle of glaze on the ground, either directly on him or 4 around him and start throwing lots of high damaging candy corn that knock back. Walking in the glaze will give you a stacking buff that will make you immune to his candy barrage. Don’t stand too long though cause at 10 stacks you get knocked down and get Sugar Crash. Oh course reflecting the projectiles in a nice way to do damage since he has a good amount of health. Skeletal Lich is a boss that a lot of people have trouble with. He has 3 distinct attacks. 1) He’ll slam his scythe into the ground very fast. This does a lot of AoE damage, fears and torments. 2) The ground around him does black and he lifts up his hand. This will immobilize every enemy (including minions and summons and also some Halloween monsters from the opposing faction) and spawn a skeleton. The skeletons give out lots of AoE Retaliation and this Retaliation is what kills zergs. 3) Same animation as skill 1, but very slow. He absorbs all skeletons and for each one he deals damage and heals himself. The key is that the second skill can be dodged to prevent him from summoning skeletons. Without them he is not very dangerous since the third attack does nothing and the first attack is infrequent enough that it can be healed trough and occasionally also dodged. His auto attacks do very little. He’s actually reasonably easy to solo knowing this. If you are fighting him in a zerg most people stack in a corner and hope to AoE the spawned skeletons down quickly, though this often doesn’t work. Dodge his skeleton spwning attack and try explaining it to people on the map to reduce the numbers of skeletons at the very least. If you have boon striping it’s very good to use it in this situation. Good guide. 🙂 I’ll add that the “stack for Lich” tactic actually works IF the zerg has high enough DPS to kill all the skeletons almost instantaneously when they spawn. The trick here is that the skeletons do not get their Retaliation boon until their spawning animation finishes. Thus, if the zerg can kill all (or most of) the skeletons before they finish spawning in, the ones that remain can be easily cleaned up. This. I solo’d him the other day very easily. Just knowing when to dodge makes this fight so much easier. I had to tell random roamers to just stay away and tag the Lich at the end to get credit so they didn’t spawn the skeletons. What is the tell for his # 2 attack if you don’t mind me asking? The ground around him goes black and he lifts up his hand. Just going to add that Mini Gwynefyrdd is also a very rare drop from ToT bags. Believe it or not I got one from the first tot bag I opened this year. Yes I already mentioned it in the minis section..
Can we expect any gemstore sales during or post halloween events ? It may be worth mentioning that Sonder the Seller in Commodore’s Quarter still sells Mini Bloody Prince Thorn for 6 Candy Corn Cobs, 3 cheaper than the Halloween vendors. Typo under Halloween Activities, third bullet point; it say “Nightfuy” instead of Nightfury. The chains on Shackles of Madness don’t drop down when you wield a weapon, making them look kinda stupid. I hope they fix this. This could possibly be caused by having your graphics settings down low, you get the same issues with the chains on Foefire’s Essence and Foefire’s Power. Nope. My settings are maxed out; including supersampling. God forbid Anet designed an item that isn’t behaving properly. It MUST be my fault. As far as i know “New!” means that it’s just a new item, not exclusive or time limited. Same was for balthazar regalia when it came out. You may want to add that using the finisher on the npc in Heart of the Mist no longer work like the past two Halloweens. I know you said players but some people may still try it out on the npc in there. The Mist) to use those finishers on enemy player. activate it before fight in Hero Panel and to actually channel it completely to activate finisher; check in Hero Panel for AP to see if it have been registered and not been interrupted). Mad Memoires: Complete Edition not possible this year? 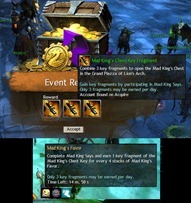 Wait what Mad king says is redoable i have tried doing it a few days and only got the key the fist time. Yes i have won and had enough for the fragments…. Shouldi make a ticket on this if i am bugged O__O i want that mini black moa.